I am not a math person. Math has been the subject that daunts me most when I think about the big picture of homeschooling. Or, at least, it did. Now that I’m 9 years into this gig (if you start counting with Kindergarten) and I have an 8th grader who is about to finish Algebra, I’m neither daunted nor worried. Perhaps part of the reason I like Math-U-See is that it is pretty much the opposite of Saxon, and I hated Saxon as a homeschooled student. MUS has short lessons; Saxon lessons are exhaustingly tedious. MUS focuses on mastery; Saxon is a spiral approach. MUS uses manipulatives to teach, even in 5th & 6th & 7th grade, making math very concrete; Saxon is abstract, and as a student I was quickly lost in the words and what they meant. MUS has no instruction in the student text, instead parent & student are supposed to view the DVD instruction together and the teacher’s manual gives suggestions for teaching the concept to the student (without a script); Saxon presents each concept (abstractly) in pages of dry text in the student book, which if done as independent work, can quickly leave the student lost (and it might take 10 or more lessons before she realizes she’s lost, and then it might feel hopeless and like something it’s better not to draw attention to – and the “she” is actually “me”). Math-U-See is based on the foundational principle that math should be concrete before it is abstracted. Abstract comes after understanding, but understanding follows concrete demonstration and concrete work. The name itself refers to the fact that it is all about literally seeing – through manipulatives, even into algebra – how math works. There is no memorizing of formulas or answers before it is demonstrated that the student concretely understands the why and how behind the functions, and can do them (and teach them) with the manipulatives. The manipulatives themselves are clever. There is a bar-block, almost like a large Lego, for each unit and also for tens and hundreds. Unlike cuisinaire rods, each block has squares equal to its value, aligned in such a way that they can be stacked. With these blocks, the DVD instructor (and author of the curriculum, a homeschool dad who didn’t like any of the math options available) demonstrates that “equals” means “same as.” He sets up a four-block and above it two two-blocks and shows they are the same length, they are equal, and equal is written as two same-length lines. When we get to subtraction, he puts up an eight block, then turns a four block upside down on top of the eight (the back side has hollow squares, and now the demonstration looks like a subtraction sign). How many squares are left after 4 are gone? With these blocks, learning x + 3 = 5 is also simple, and taught very early on. Set it up with the blocks, the five on the bottom, the three on the top. What do you need to make them equal, to make it look like an equal sign? Making shapes with the blocks also makes it clear what “area” and “perimeter” mean and why the math gets you the right answer. Multiplication is taught with skip counting and pattern recognition as well as with the blocks. Multiplication is finding area. 3 x 3 means “3 by 3” or three up and three across, and when you construct that, you can see it is the same as 3 3s and totals 9. Even fractions get their own special manipulatives that make it clear why a fraction of a fraction (that is, fractions multiplied) is smaller rather than larger, why you have to have the same denominator to add, and how 1 can be represented by fractions. Fractions were still painful for my students so far, but I felt better equipped as a teacher to go back to the basics, to explain with clear terms, and to stick with it until they mastered it (rather than moving on as soon as they had a “C”). There are even Algebra manipulatives! However, my first and so-far only Algebra student hasn’t used them. He watches the video teacher’s demonstration and jumps right into abstract – he’s ready for that kind of thinking. He understands the concepts and gets most problems correct, so I don’t force him to use the manipulative himself. I love Math-U-See’s emphasis on place value. Math-U-See begins with the concept of place value and returns to place value to teach every new function. Without place value, you can’t understand why numbers do what they do when you start combining them, so it is important. Math-U-See has some handy sayings for learning place value – like “Every number has a place” and “place means value.” The numeral 9, for example, means 9 units if it’s in the unit place, but it means 9 tens if it’s in the tens place. It has been quite helpful to have this vocabulary to show my beginning-regroupers that 12 + 8 does not equal 2. Without the zero, that means 2 units, not two tens – you need the zero to put the 2 in the ten place. Place value is also helpful when they want to work equations from left to right, like reading and writing. No, with math you have to start at the unit place and move up the “street” from there. Place value brings greater clarity to long division, too. And when you hand your student graph paper on which to do his figuring (highly recommended), you can always remind him, “Keep each number in its right place!” and he might sigh and slump, but he knows what you’re talking about. I love Math-U-See’s mastery approach. Personally, I was burned as a math student by just cruising along at a lesson-a-day pace, self-correcting and able to call a grade “good enough.” For a time, I was able to just get the right answer, often enough, to keep going until one day I was halfway through the book and totally stuck. With Math-U-See, there are concrete ways to demonstrate understanding. This curriculum is designed to help students see how numbers work, not just drill in steps to get the right answer. Saxon was written to help kids test well. 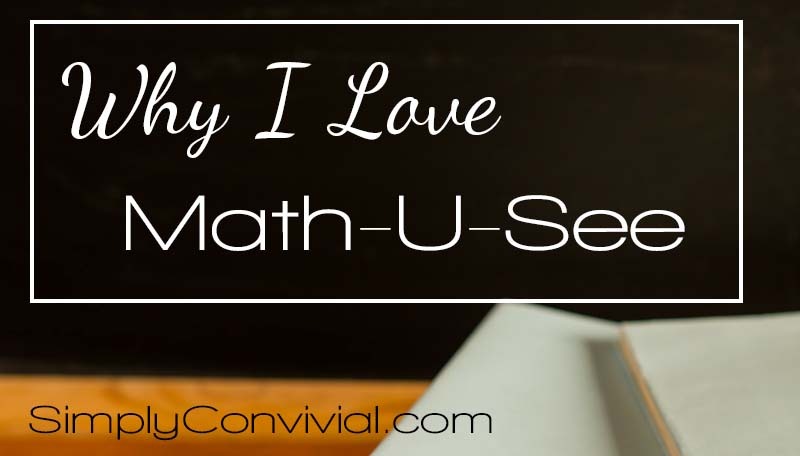 Math-U-See was written to help kids understand why formulas work. The mastery approach is epitomized in the fact that MUS books do not have grade levels. You start your child when he’s ready and you move at his pace. There is no such thing as “behind” or “ahead,” only where your student is. 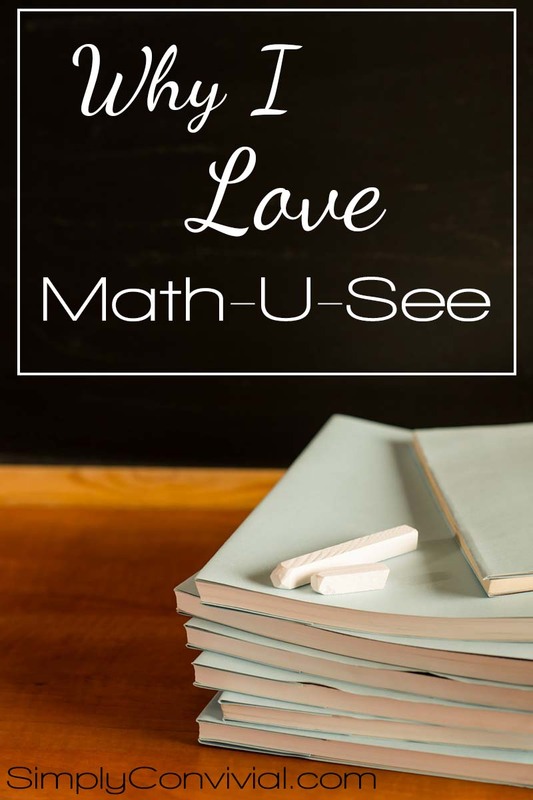 Math-U-See wants your kids to have all the facts drilled, understood, and quickly correct before moving into more abstract math. That might take a year, it might take longer, but don’t move on until they have it. In our home, sometimes it appears there is mastery (evidenced by 100% on math pages on the first attempt), but later it becomes evident they’ve forgotten. So we go back and review until there’s mastery – again. Better to keep those foundations shored up than to build on a shaky foundation. In the end, the building will be higher and stronger. Day 1: Watch the lesson, work the first few problems with mom (for elementary students), complete page xA. If they get it and want to move on, they have to also complete a Systematic Review page and get 100% on it. If they don’t get 100% on the first try, they have to correct the page until it is 100% – leaving errors unsolved is not acceptable. Day 2: If it seems like they need more practice with the concept, I give them the B page. If it seems like they understand it, I give them a systematic review page. Either way, if they get 100% on the first attempt, they pass that lesson. If they do not get 100% on the first attempt, they rework their errors until they do have 100%. And so on…because they’re reworking every error, they’re incentivized to work correctly the first time – sloppy work that leads to errors will always have to be fixed, so it never saves time. Because all errors have to be worked until they are correct, we are always aware and working on the concepts they are having trouble with. I often watch them rework errors, and in that way have seen when more review in multiple-digit multiplication or fractions or some other foundational concept is the tripping point. I love Math-U-See’s DVD instruction. Now, although I have to be aware of what’s going on and how my kids are doing, I don’t have to pull up the inner resources to teach concepts directly to each one of them. Instead, they learn the concept by watching the author of the program teach it – engagingly, with humor, with multiple concrete examples and explanations. I couldn’t pull that off myself, but watching him do so helps give me a starting point and a vocabulary when I do sit down with a child and his math page. Plus, I can have them review by rewatching lessons – and unlike myself, recorded Mr. Demme is still just as cheerful and still just as ready to crack a joke the third time as the first. I love using the same math curriculum for all my children. Currently, I have 1 student in Algebra, 1 in Zeta, 1 who will start Gamma as soon as she passes xtramath addition, 1 who just started Beta, and 1 who is learning to write her numbers and count. 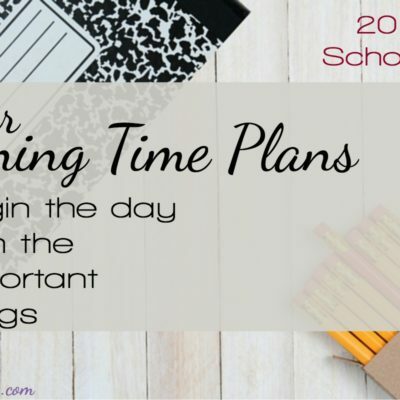 I know some choose different math curriculums for different kids, but unless you have a really compelling reason and pressing situation, I recommend choosing the curriculum that resonates with you as the mother-teacher. 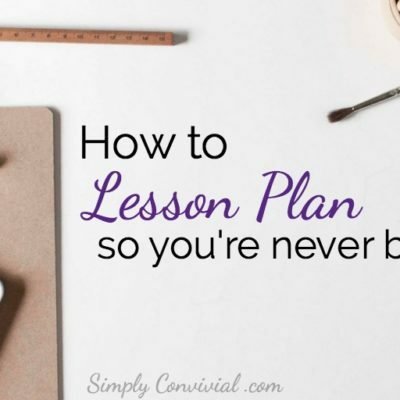 Learn one system, know the ropes, be able to adapt and teach math with the curriculum (even if there’s a DVD teacher provided), and you’ll experience better success than if you expect the curriculum to do everything for you and your student. What can you teach? What math curriculum can you be grateful for every time you pull it out? Stick with that one and you’ll have a greater likelihood of consistency and success. Switching math curriculums comes with a high cost, as different programs teach with different vocabulary, in different orders, and in different ways. For awhile, you’re not necessarily learning math, just learning a new system of learning math. Better to find a program that fits you, then teach it to each of your children. As for me and my house, we love Math-U-See. If you have Math-U-See questions, ask in the comments. I plan to write a “tips for Math-U-See” post soon! curriculum, What I've learned about homeschooling math. Ah, perfect timing, Mystie — this answered most of my questions about MUS as I prepare to take the plunge and invest in Primer for my oldest. I too am leery of teaching math, as it wasn’t my strong suit – and I literally cried through Saxon Algebra 1! We did other things for earlier grades, and I was always envious of my 9-years-younger siblings laughing through Teaching Textbooks Algebra and more. Totally unfair. ;-) Anyway, looking forward to starting this next year! Here’s an easy one. How do you store your blocks? I have 3 kids in MUS plus a 3yo and a 21 month old. We have the wooden box, but part of it cracked, so I am afraid that will continue. I keep them out of reach of the littles, but that means I am the only one able to get to them. Sometimes I skip getting them out because it is inconvenient, but I know that doesn’t serve my kids well. I’ve thought about about a tackle box style craft organizer, but haven’t decided to go for it. I look forward to hearing how you do it! Thank you for sharing how you structure your lessons. I have been making my kids do every page, and I know they would be happy to skip ahead when they’ve mastered something! My six year old hates using the math blocks. She says they make her feel dumb. I see that they help her grasp the concepts faster. Should I make her use the blocks every time? I would talk to her about why she hates them – more than just feeling dumb. Is that because it feels like a “little kid” way to do math? Is it because she feels like they slow her down? I have mine show me the concept with the blocks after they learn it, and do at least the first 5 problems on the A page with them. Then it’s “as needed.” If they come to me with a question on an equation, the first thing I say is, “Let’s build it!” and have them try to do it with the blocks – usually they can then get the answer on their own and I don’t have to say anything else. Or, if they try to build it and get the wrong answer, I can see where their process took a wrong turn and help them more effectively. So, yes, she should be using the blocks, but not necessarily for every problem, every time – just until she has mastery, then she can use them when she hits a snag. Thanks, Mystie. We’ll try that. I’ll try to figure out why she doesn’t like the blocks. I’m looking forward to using this with both kids and once you make the initial investment, the books aren’t that bad I guess ;) As others have said, I’m curious about different storage methods. We still have it in the original case, which obviously won’t last all the years we need it. I’m a HUGE advocate of MUS now. I just love it and love teaching it. Then again I’ve always loved math ;) Though I feel public school failed me in that I should have been pushed to gifted classes but never was. Ooops! We also got their Spelling You See and are really enjoying the Jack & Jill level. We also use Spelling You See and love it. It is fun to explain to non-homeschoolers why my kids don’t drill words and do tests, but I am completely sold on the method. I have seen EASY gains for my son (who hates all things hand-written). I have seen a huge improvement in my son’s handwriting because he does this daily as well as handwriting. Plus it’s just fun – he loves the nursery rhymes. We use Math U See too, and love it (well I do anyway). I never thought of giving kids separate pages, I always left them in the workbook. 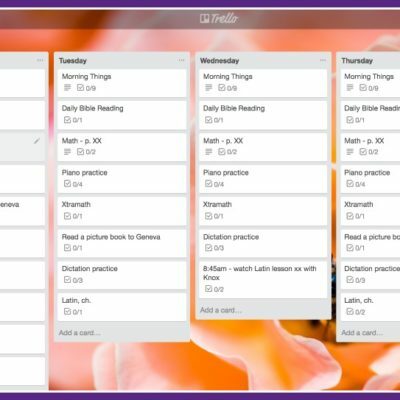 I can see how this could help with accountability, but I am curious how you maintain completed work. A completed set would be a lot of loose pages. We throw away (or use as kindling in the fireplace) completed math pages. :) Sometimes I snap a picture of a completed page for our records, but I’m not too concerned with record-keeping (we live in a lenient state and our end-of-year testing is in our records). I too love Math U See! We struggled when my second son just couldn’t get math. We were using Abeka, but it was not working for us and moving at way too fast a pace. Just for the ease of it, we went ahead and switched both sons. Now I have 5 kids using it and three more that will when they’re school age. We don’t always use the blocks if I see that they get it, but in the beginning it really helped to make those numbers concrete. Decimal Street is so great for making them understand when we need zeros for place holders. His skip counting songs made me learn how to skip count numbers that I had never learned to skip count. Haha! His math movies do so well explaining things too! I was so worried about teaching Algebra, but my oldest is in Pre-Algebra and I am loving doing his work with him. When he has a question I sit down and do it with him before looking in the teacher’s book. That way I’m learning with him. In my school days, I guessed my way through the SAT, never understanding one question. However, I did make a good grade…I fooled a lot of people. ;) Now I understand it because of Math U See. Never again will I use another math curriculum. We have switched grammar, science, history, etc. multiple times, but math always stays the same in our homeschool. The funny thing is, I resisted buying it in the beginning because I thought the blocks were a crutch and kids weren’t really learning. Boy, was I wrong! One more thing, my kindergartner has been having a hard time learning his addition facts in Primer. I have been making him watch the Math Facts movies by Preschool Prep Co. 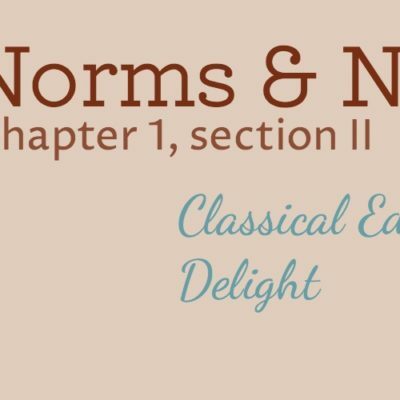 They are excellent for helping that visual, audible learner. He remembers a lot of facts now because of the songs or pictures. Just thought I’d throw that resource out there in case anyone else had children that have trouble memorizing. I got my movies very inexpensively in their after Thanksgiving sale last year. They did it again this year, and I wouldn’t be surprised if they have another big after Christmas sale too. I recently went back to MUS with another child, our 11 year old dyslexic son. He finished Alpha and now I have him working through Beta test book. He does one test a day, so far with ease. I intend to continue in this manner through Gamma, Delta, etc., until he hits uncharted territory. Then we will stop and place in that book, working through it together, picking up teaching as recommended. I also used upper levels of MUS successfully with an older child (homeschool graduate). After pulling her from public school in 6th grade, trying and failing with many other math programs, MUS was a hit! Thanks for reassuring the post! If you are on Facebook, find some Homeschool buy/sell/trade groups. Someone had Primer with blocks for a really good deal I snagged because she said it didn’t work for them. I only had a couple of pages I had to erase on. I don’t think you should start without both the DVD and teacher’s manual. In my opinion you need one or the other to set up the correct vocabulary for the entire curriculum, you know? Several of my local friends have said they didn’t “need” the teacher book until Gamma. That they knew enough to get through the workbook. However the teacher book does of course have the answers so that’s your call. So I’d recommend you get the full suite of Primer to learn MUS in general and could likely “get away with” just the kid’s workbook and test book for Alpha. I added the Alpha student books to my cart at Christian Book Distributor but didn’t buy. They then sent me an email for free shipping, which helps ;) I’m trying to get the Alpha DVD on a Facebook group but with Christmas it’s very slow getting people to respond. Hope this helps! I don’t have the teacher’s book for Primer or Alpha, and I never use it for Beta either. It’s such simple math that there is no need for it. If you call them, you can order just the dvd, and I often find them used on swap groups, ebay, and in a local homeschool resale store. I think the dvd is essential because it really helps the kids to watch Mr. Demme teach it. As long as you’re watching it too, you won’t need the teacher’s book. I only use it for grading the upper grades because it’s a lot easier than doing each problem myself. :), I bought my blocks used as well, so check out all your cheaper options! If buying full priced were the only way to go, I would still do it in a heartbeat knowing what I know now. It works! If you can find the DVD without the teacher’s manual, you’ll be fine. Without using MUS before, you’d at least want the DVD for Primer so you and your child learn the MUS terms and categories. I don’t use the teacher manual or test book until Gamma, but my kids all love watching the video lessons. Is there a way to buy the student book as a pdf or ebook? Buying one student book per child, every year, would be expensive! No, they’re consumable workbooks like most workbook curriculums.